This entry was posted on Tuesday, November 6th, 2018 at 11:32 am. 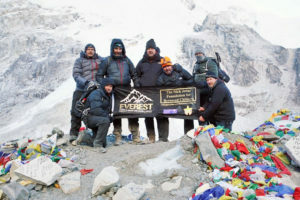 A FUNDRAISING climb team, headed by terminally-ill father, Nick Jones, reached Base Camp of Everest on Tuesday 30th October after a relentless week. Nick and two other climbers have also embarked on a further challenge of reaching Island Peak. The team left with an emotional farewell on Friday 19th October with worries as to whether Nick’s health would see him through the epic challenge ahead. Nick has malignant hypertension and was told by his doctors that this trek could possibly be the last thing he accomplishes. However, the determined father-of-two wouldn’t let that stop him. Despite suffering with altitude sickness, freezing temperatures and long, hard days, he led the team to the Base Camp of Mt. Everest. The team continue to raise money for The Nick Jones Foundation for Bereaved Children, a foundation Nick has set up to help children who are dealing with the loss of a parent. Since the team left, Facebook has seen hundreds of comments from supporters and family willing them on following their daily updates on Facebook. After reaching base camp, Nick Jones told White Horse News from the mountain, “It’s hard to put into words for me. The relentless days climbing were something I have never experienced. At times the pain and breathlessness were frightening. “The 5am start to base camp was hard, but then we had to face an 11-hour trek back down to our teahouse! Reaching base camp was so emotional for me, I could hardly speak. Passing graves of lost climbers and for me to stand there alive after being told I couldn’t do it, was mind blowing. “I dedicate my climb to my children and to every child who has suffered loss or is losing a parent. “We still have a long way to go yet, but I wouldn’t have done it without the team. But onwards we go to Island Peak Base Camp, a daunting place around -20 degrees. Cameron Jones, Nick’s son said, “My dad is a legend, and I wish to follow in his footsteps and conquer Everest Base Camp and beyond when I am older just like he has. Although I appreciate I have very big boots to fill. “He is my hero and my goal is to make my dad proud and push his foundation like he has asked me to. “It’s been tough without him being at home, we have managed to video call each other most days which reassured me he was safe and well. Dad, you rock!. Lara Jones, Nick’s daughter said, “My dad is the most important and inspirational person in my life. I’m bursting with pride by what he has achieved, he is simply incredible. “It was one of the hardest days of my life saying goodbye when he left with the team. I’m counting down the days until he comes home. “Watching him reach his goal on live video call was fantastic, and knowing that he has helped other children and their families along the way makes me very happy. Melanie Jones, Cameron and Lara’s mother said, “I am overwhelmed by Nick’s sheer grit and determination. After accompanying Nick to his recent appointment with his consultant cardiologist, Dr Rob Lowe, it had a very sobering effect when he, as a professional, outlined the dangers this trek could have on Nick. “I’ve emailed Dr Lowe pictures of the team reaching base camp – his reply was ‘simply phenomenal!’. “Nick and I are proud beyond words of our amazing children, who have showed such positivity throughout, giving Nick encouragement during their own difficult time. On Thursday 1st November Nick, Kerry and Stewart trekked a further three hours to Island Peak Base Camp, taking their challenge to the next level, leaving the remaining climbers to make their descent. Once there,the plan was for Nick to return to Chekung Village, leaving Kerry and Stewart to continue ascending the treacherous mountain. However, with an arduous trek, and Nick having to be administered oxygen – the team decided that it was more important to get everyone home safe and well and began their descent back.